To book, click on dates below. You will be taken to our Eventbrite page for booking. Rate per person: $95 (plus $ 7.35 processing fees). Classes are added frequently, so check back to see our new offerings. Want a private group class for you and your friends? Visit our Private Group Classes Page. Note: Ingredients are most often organic, natural or minimally (if at all) processed. We will do our best to keep the ingredients/menu exactly as written, but substitutions may be made occasionally due to market availability and to ensure the freshest produce possible. Marlene will show you how to recreate the authentic flavors from her childhood using cookery techniques learned from her family and from traveling extensively, taking culinary classes throughout the region. Classes are often inspired by cuisines from Vietnam, Thailand, Philippines, Japan and China. Asian cuisine is largely gluten-free and one of the tastiest and healthiest cuisines in the world. In this class, we start with one of our fave apps, crisp cauliflower fritters served with an easy-to-make and flavor-packed tomato dip. Learn to make garam masala from scratch, the primary spice blend we will use in our main course: a yogurt-based Indian Chicken curry Marlene grew up with, typically served in British establishments in Manila with an awesome mango chutney even Major Grey would be proud of! A salad of organic greens cleans the palate and we cap the evening with lip-smacking golden-fried apples with an exotic honey drizzle. Get ready to roll out some dough—we’re going to make this elegant pizza of organic figs and three cheeses that’s an absolute favorite with friends. And that’s just the appetizer. Jeff will share a restaurant secret in making perfectly cooked cod loin, and we will prepare a compound butter that’s a match made-in-heaven with roasted butternut squash. Finally, we’ll cap it with divine cacao and hazelnut cookies with a dollop of our favorite organic ice cream. Roasted Vegetable Lasagna: You’re not going to miss meat with this luxuriously decadent vegetarian fare. 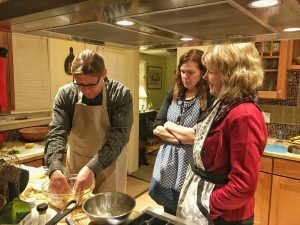 In this class, we’ll learn about soffritto and mirepoix that puts the “classic” in our Tomato Soup and a French sauce that transforms this lasagna into “food for the gods”. Finish off with a no-dairy luscious dessert that’s super easy to make! This class is gluten free as we will use gluten-free lasagna noodles from Italy. Healthy Asian cuisine just got healthier! We’ve designed this cooking class to have all the authentic flavors of Asia without sacrificing the Umami that usually comes from fish sauce. You’ll learn about unusual ingredients like agar agar and pandan, roll fresh spring rolls, make your own peanut sauce from scratch, have a soup course that can be a meal on its own with typical Asian garnishes and make a ridiculously easy guilt-free dessert. Would you believe it’s gluten-free too? New!!! This is the vegan version of our British-style Indian curry class. We start with one of our fave apps, crisp cauliflower fritters served with an easy-to-make and flavor-packed tomato dip. Learn to make garam masala from scratch, the primary spice blend we will use in our main course: a Mixed Vegetable curry with an awesome mango chutney even Major Grey would be proud of! A salad of organic greens cleans the palate and we cap the evening with lip-smacking golden-fried apples with an exotic maple syrup drizzle.